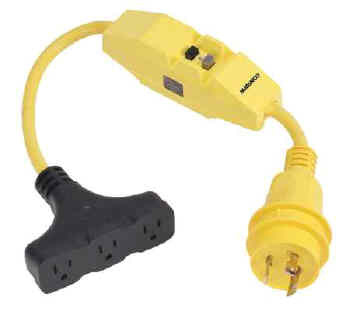 Dockside adapter that provides safer hook-up to 30A dockside power by providing protection against harmful electric shock and reducing the possibility of fire. Can also be used for other outdoor, harsh environments such as construction sites or wherever ground fault protection is desired. Note: A Ground Fault Circuit Interrupter (GFCI) limits the duration of an electrical shock to a period considered safe for healthy people. It does not prevent electric shock. This device does not protect against electric shock due to contact with both circuit conductors or a fault in any wiring supplying this device. • Can also be used for other outdoor, harsh environments such as construction sites or wherever ground fault protection is desired. • Total load of attached tools must not exceed 15 amperes at 120 volts RMS, 60 Hertz or 1800 watts. NOTE: A Ground Fault Circuit Interrupter (GFCI) limits the duration of an electrical shock to a period considered safe for healthy people. It does not prevent electric shock. This device does not protect against electric shock due to contact with both circuit conductors or a fault in any wiring supplying this device.